Why don't I have as many DNA matches as ....? Earlier this week I made a free transfer of two of my grandsons' atDNA results from MyHeritage to Family Tree DNA (FTDNA). Since the lab testing for MyHeritage is done in FTDNA's Houston lab, this is a fairly seamless process. As with any new procedure there were a couple of minor obstacles. FTDNA had yet to upgrade the Autosomal Transfers entry icon to mention that MyHeritage kits could also be transferred. Also, there were no instructions that the "-" needed to be removed from the MyHeritage kit number before FTDNA could be identified and validated. Example: MH-XXXXXX needed to become MHXXXXXX before the transfer could be initiated. These transfers were completed within a few hours and allowed me to use Family Finder's chromosome browser tool. I was then able to continue my learning process which had begun a couple of weeks ago when I received access to these results at MyHeritage. My previous posts demonstrated that grandchildren do not inherit equal amounts of atDNA from each grandparent although it appears that each set of grandparents contribute 50%. To review this post click here. I then made a follow-up post in which I demonstrated that these variances of amounts of atDNA inherited by a grandchild can alter ethnic predictions between full siblings. To review this post click here. If these changes sometimes can be observed within only two generations, we can only imagine how they could be skewed over five or six generations of compounded random inheritance. This explains a big part of the differences between ethnicity predictions of full siblings. Grandsons do not inherit any xDNA from their paternal grandparents. In this image the atDNA contribution of maternal grandparents are charted for grandson #1. Note that xDNA was inherited from the maternal grandparents through the child's mother. In this case about 28% of the grandson's atDNA was inherited from the maternal grandmother (represented by the orange bars). 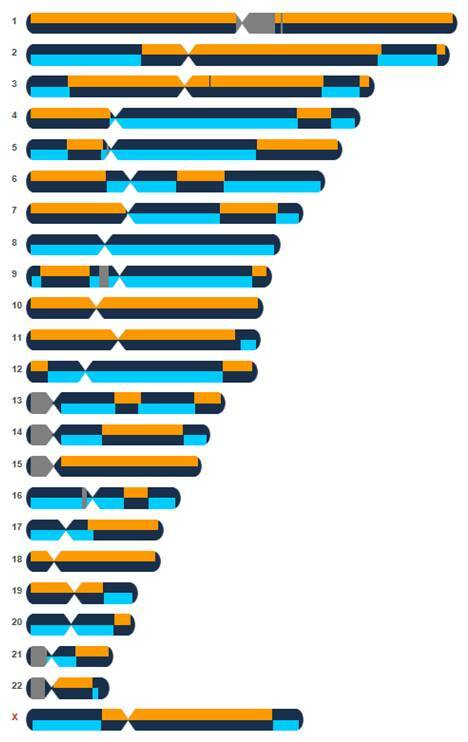 About 22% came from the maternal grandfather (represented by the bright blue bars). 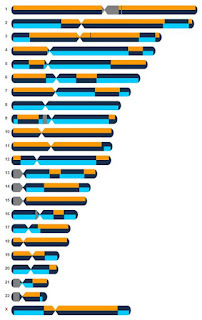 Crossover points are clearly visible where the contributed atDNA shifts from the maternal grandmother to the maternal grandfather on this maternal contributed strand. In this image the atDNA contribution of maternal grandparents are charted for grandson #2. Note that xDNA was inherited from the maternal grandparents through the child's mother. 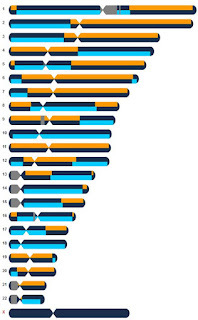 In this case about 26% of the grandson's atDNA was inherited from the maternal grandfather (represented by the orange bars). About 24% came from the maternal grandmother (represented by the bright blue bars). In this image the atDNA contribution of the paternal grandparents are charted for grandson #1. Note than no xDNA was inherited from the paternal grandparents through the child's father. 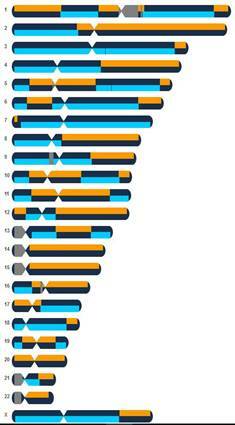 In this case about 28% of the grandson's atDNA was paternal grandfather (represented by the orange bars). 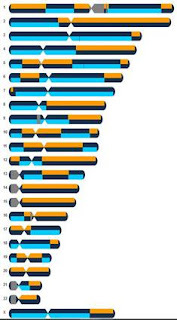 About 22% was inherited from the paternal grandmother (represented by the bright blue bars). In this image the atDNA contribution of the paternal grandparents are charted for grandson #2. Note than no xDNA was inherited from the paternal grandparents through the child's father. 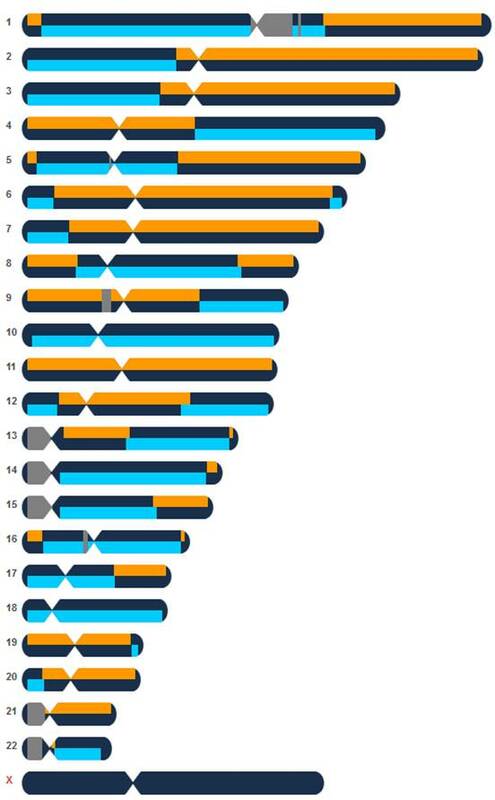 In this case about 26% of the grandson's atDNA was paternal grandfather (represented by the orange bars). 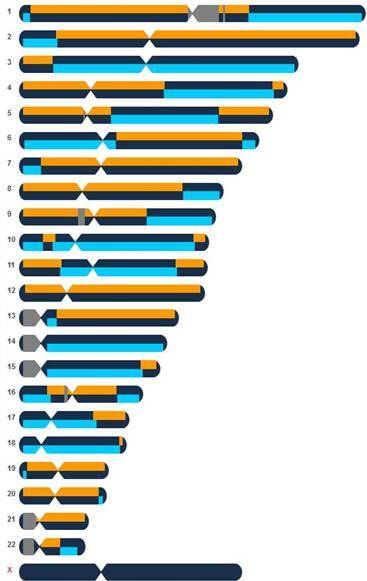 About 24% was inherited from the paternal grandmother (represented by the bright blue bars). One other item of interest to report came out of this exercise. Family Finder identified more Ashkenazi DNA from both grandsons than did MyHeritage. One grandson appears to have inherited about 22% of his atDNA from his primarily Ashkenazi grandfather. No other grandparents have been shown to have any Ashkenazi inheritance. Family Finder Identified about 18% of this grandson's atDNA to be Ashkenazi. The other grandson appears to have inherited about 26% of his atDNA from that Grandfather. Family Finder identified about 21% of this grandson's atDNA to be of Ashkenazi origin. MyHeritage had identified the first grandson to have 10.8% Ashkenazi and the second one to have 17.5%.